The year 2011 is a watershed year in the history of Bell & Ross. A master of military inspired watchmaking, the Franco-Swiss brand is once again setting the pace by updating the 1920s timepieces that were first worn on the wrist to today’s tastes. Bell & Ross is thus paying tribute to military timepiece history by introducing a pocket watch transformed into a wristwatch – the Vintage WW1. 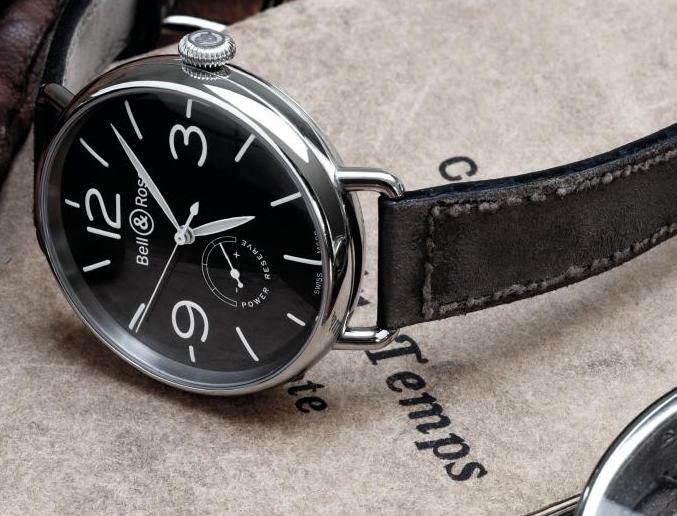 In 2011, similar to a movie flashback, Bell & Ross is boarding a time machine and offering a nostalgic, yet modern pocket watch transformed into a wristwatch – the Vintage WW1. This is a unique way of reinterpreting the history of the military watch an approach that has always guided the brand’s designs. The re-imagining of those bygone days is a two-phase process: the design of a fob watch of rare sobriety, the PW1 standing for Pocket Watch 1 and the introduction of a wristwatch christened the WW1 for Wrist Watch 1. First worn by French soldiers during the Great War, these wristwatches were then tested experimentally by pilots in the 1920s before being declared technically reliable in the 1930s. The Vintage WW1 pays tribute to this era and takes its inspiration from the stylistic designs of the “Roaring Twenties”, yet does so without appearing dated. A true missing “time” link between the pocket watch and the wristwatch of the 1940s, the shapes and functions of the Vintage WW1 reflect all of Bell & Ross’ genetic codes. In 2005, Bell & Ross metamorphosed aeronautical cockpit displays into an inimitable square watch – the BR01. In 2011, the brand is once again living up to its reputation by transforming a pocket watch into a wristwatch. The Vintage WW1 model clearly stands out as a reincarnation of the past into the present. A large diameter fob style case, horns welded to the case that are used as lugs, elegant, robust leather straps, an extremely readable dial, a fluted crown that is easy to handle with gloves, a top quality mechanical movement. The Vintage WW1 could have been worn by a pilot from the ’20s. In the 21st century, it will be worn by those looking for a large, classic and elegant timepiece that truly stands out. A masculine icon, this flawless watch is the beginning of an era of a new style: military neo-classicism. Dial: galvanic black, sunburst, domed. Index, figures and hands covered in photoluminescent coating. Functions: hours, minutes and small seconds. Crystal: anti-refl ective domed sapphire. Case: diameter 49 mm. Polished steel. Functions: hours, minutes and seconds. Power reserve indicator. Case: diameter 45 mm. Polished steel. Dial: galvanic black, sunburst, domed.Index, figures and hands covered in photoluminescent coating.